GolfBC Group is excited to announce that the GBC Golf Academy has now officially opened at all GolfBC locations in British Columbia! 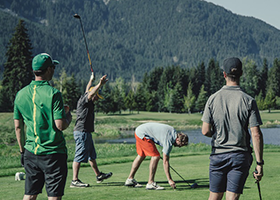 First launched in the Spring of 2003 at Olympic View and Arbutus Ridge on Vancouver Island, the GBC Golf Academy has since received province-wide recognition for its award-winning Instructors and variety of instruction programs that cater to students of all levels of experience. At the GBC Golf Academy, we believe every golfer can improve and have more fun with their golf game. To help golfers of all skill levels, we have developed a teaching philosophy that everyone can understand. This teaching philosophy, our world-class facilities and expert instructional staff ensure your time with us will be both rewarding and fun. The GBC Golf Academy boasts the biggest and most qualified instructional staff in Western Canada. Between the participating GolfBC courses in B.C., the Academy has more than 20 qualified CPGA Professionals to help improve your game. Our instructors must complete a comprehensive training schedule to become GBC Certified. This ensures that every lesson, corporate outing and golf school at the GBC Golf Academy will provide expert insight for your game. At the GBC Golf Academies, we believe that everyone can learn to play better golf and can learn to enjoy his or her golf more. In order to help our students - young and young-at-heart, we have developed a variety of instruction programs that are easy to understand and are effective for all levels and abilities of golfers. Our goal is to help you have more fun playing golf. Each golfer has a different perception of fun when it comes to golf. For some, this might mean lower scores. For others, it might mean playing golf without embarrassment and enjoying the day on the golf course by hitting the ball better.